I received a copy of this book from the publisher a while back. I've been intending to try out some of the lovely projects myself before reviewing but simply haven't gotten to it. The projects are lovely, all jewelry made using crochet and sewing techniques (mostly crochet). This style of jewelry is in fashion these days and there couldn't be a better time to crochet a necklace or bracelet. The book is Beautiful Hand-Stitched Jewelry: Crocheted, Embroidered, Beaded by Emi Iwakiri (on Amazon). The author has a blog here (in English via Google Translate). Below are a couple of my favorite projects. I'm sorry the pictures are so horrible. I couldn't get a proper scan. 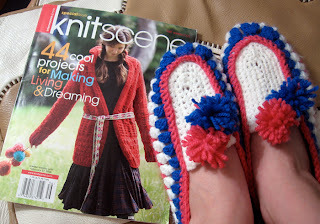 These crocheted slippers were an impulse project (much like an impulse purchase - the project must be done and it must be done now). My feet were cold and I got inspired. The pattern is from the first issue of Knitscene (Fall/Winter 2005) . I have poured over this magazine many times but the only thing I had ever made was crocheted circles. I used Plymouth Encore yarn (leftover from a Mod style sweater for my brother). The pattern calls for a size I hook which I couldn't find. I used a size H hook so my gauge was a little small. 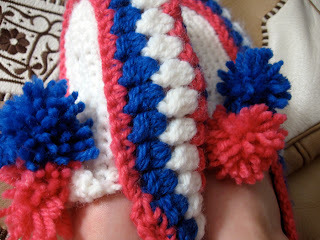 To cover up for it I crossed my fingers and made the largest size slipper, just one size too big. It was a pretty easy pattern and came together very quickly. I added an extra row of stitches around the back heel of the slipper, gradating from single crochet to double. Then to give a snug fit, I wove yarn around the opening and used the ends to tie on the pom poms. It was rather silly to start another project because I have way too many right now. Coincidentally, Knitting Daily this week was discussing why we have unfinished projects. It was nice to do a crochet project, for a change. Next I need to continue working on my dress for my brother's wedding. The progress on my dress varies from triumph (such pretty pleats!) to dismay (Argh! I look like I'm ready for Christmas in 1986). I have a plan and fingers crossed it will turn out without too much trouble. If only I wasn't so picky and vain.